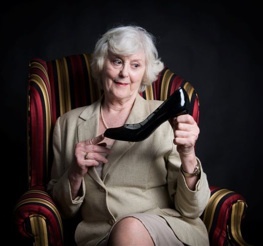 Three theatre groups have joined together to present a delightful, well conceived evening of two one-act plays highlighting the talents of veteran actresses. Both plays premiered in 1998, one in the U.S. and one in Britain, and both examine a power relationship that turns on its head. The two plays – The Way of All Fish by Elaine May and Miss Fozzard Finds Her Feet by Alan Bennett – are not only enjoyable in themselves but work well as a pair, just as the best double-bills should. The Way of All Fish, the first play of the evening, finds us in the office of Miss Asquith (Elva Mai Hoover), a top business executive in Manhattan. After Asquith chides her skittish secretary Miss Riverton (Tracy Rankin) about throwing out her exercise bands, Asquith discovers that she has no engagement for the evening and makes an about-face towards Riverton by suggesting they two order in take-out and dine together that evening. Drinking wine on empty stomachs as they wait for the order to arrive, the self-absorbed Asquith loosens up and makes an attempt to get to know the woman who has been working for her. Suggesting Riverton say whatever pops into her head, Riverton reveals that her dream since childhood is to be famous. Knowing, however, that she has no special skills, she realized the easiest way to achieve lasting fame was to kill someone famous. Fleeting fame could still be achieved by killing someone rich. As Riverton continues, Asquith becomes increasingly ill at ease. Elaine May’s play has the veneer of a traditional Broadway play with its reassuringly naturalistic dramaturgy and setting. Yet, the play’s implications are quite radical. This seeming innocent tête-à-tête between employer and employee exposes the rigidity of a class system in the supposedly egalitarian U.S., where everyone is free to pursue their dreams. When Asquith tells Riverton that she pays her $30,000 because that’s what she’s worth, she implies that she, as employer, is “worth” the exorbitant amount she is paid. May is quite aware that the social Darwinism present in American thinking goes completely contrary to the idealism of people’s freedom to realize their dreams. She has Asquith state outright that in business as in nature only the strongest thrive. Her example, that gives the play its name, are the various species of fish where the loser in a battle of two males will turn female. This notion eventually leads to a comic contest of strength between Asquith and Riverton. May’s critique of women in power turns out to be quite similar to that of Caryl Churchill in Top Girls (1982). For both, women at the top of a business hierarchy act no differently than men. Miss Fozzard Finds Her Feet is just as funny as May’s play but much gentler. The play was originally part of series of twelve solo plays Alan Bennett wrote for the BBC under the umbrella title Talking Heads. The play is not naturalistic, with the central actor Nonnie Griffin, narrating her tale as Miss Fozzard and playing another five characters including her brother Bernard and her new chiropodist Mr. Dunderdale. Director Terry Tweed emphasizes this by lining the apron of the stage with a wide range of women’s footwear that Griffin uses at various points in the action. Miss Fozzard, a woman at the upper end of middle age, used to work in the “soft furnishings” section of a department store in a small town, but has had to take leave to care for her brother Bernard who has had a stroke and has not yet regained his speech . Miss Fozzard’s one indulgence is visiting the chiropodist, so she is distressed to learn that the chiropodist she has used for years is moving out of town. Rather than choosing a young female as a replacement, Miss Fozzard selects the 70-year-old Mr. Dunderdale, who takes on occasional clients. Unlike her brother, Miss Fozzard has never led a life of pleasure, so she is surprised at the politeness and compliments she receives from Mr. Dunderdale. He not only agrees to take her on as a client, but eventually suggests that they meet more frequently, at no extra cost to her. He also begins giving her presents. When Miss Fozzard asks what she can do in return, he suggests she could help his back pain by walking on his back. Contrasting with the strife of the May’s play, Bennett’s focusses on the gradual reversal of the doctor-client relationship that occurs between Miss Fozzard and Mr. Dunderdale. What makes the play so amusing is the complete innocence of Miss Fozzard’s narration. She merely gives us the facts of the case and keeps her attitude toward them modestly to herself. Both plays are hugely enjoyable due to no small degree to the finesse of the three actors. Elva Mai Hoover is wonderfully imperious as Miss Asquith in the first play and much of the humour derives from watching her character’s awkwardness in trying to converse with a “real” person and later her growing distress at her secretary’s murderous fantasies. Tracy Rankin is very funny as Miss Riverton, first in her abject servility to Miss Asquith, then, disinhibited by wine, in the fervour that grows as she explains in disturbing detail what she has learned from the more famous murders in history. Director Dian Marie Bridge brings out the contrast between the two through Miss Asquith’s curtness and uptight posture versus Miss Riverton’s expansiveness of voice and gesture. Nonnie Griffin is a master of Bennett’s wry humour. She is especially impressive in showing us how Miss Fozzard’s cantankerous brother gradually returns and in her highly sympathetic portrayal of Mr. Dunderdale’s low voice and gentlemanly behaviour. She lets us see with great subtlety how the drabness of Miss Fozzard’s life gradually fades away to be filled with contentment as her sessions with Mr. Dunderdale become more unusual. Women of a certain age are generally ignored in contemporary film and even on the stage. This double-bill shows what a great loss that is. The main pity is that the show has such a short run. To see these three fine actors in two very amusing, subtly subversive plays, you really should rush to the box office to get a ticket. Photo: (top) Elva Mai Hoover and Tracy Rankin; (middle) Nonnie Griffin. ©2013 Shy Alter.